Unwind in refreshed accommodations at Houston Marriott North. Our hotel offers a complimentary shuttle service to and from George Bush Intercontinental Airport and puts you close to major businesses in The Woodlands and Greenspoint area. From the moment you arrive, expect friendly service that exceeds all of your travel needs. Make yourself at home in sophisticated rooms featuring plush bedding, flat-screen TVs and high-speed Wi-Fi. DEN, our restaurant open daily for breakfast, lunch and dinner, serves American cuisine that is also available through room service. Host an event in North Houston and utilize our 15,990 square feet of versatile gathering space with available on-site catering. If you're here for work, enjoy easy access to a host of golf courses to help you close a deal. During downtime, our fitness center and indoor/outdoor pool provide the perfect opportunity to get in some exercise. 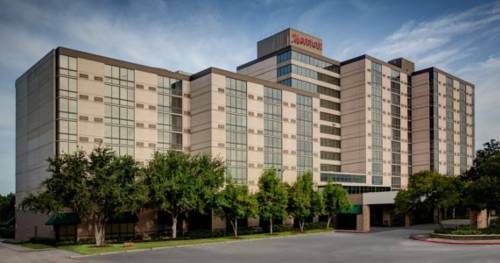 Houston Marriott North is ready to make your stay memorable in South Texas. Find hearty and healthy options on our restaurant menu filled with shareable starters, large salads, steaks, seafood, sandwiches and burgers. Starbucks coffee beverages and an extensive wine list complete your stay in North Houston.